Well the subject message last night certainly brought passionate thoughtful responses. Below are four that illustrate the flavor of all of them. They were received before the detestable Associate Justice David Souter announced his retirement thereby opening up a Supreme Court seat for BO to appoint another Statist who will continue to negatively affect our way of life for decades by turning the rule of law on its head like in the terrible treatment given to the Chrysler bond holders whose senior debt contracts will be torn up in favor of UAW interests if BO has his way. During the campaign Carol used to tell people that the appointment of judges was reason enough alone not to vote for BO - now 89 year old Stevens & former ACLU lawyer Ginsburg who is in poor health can also retire knowing their work will continue by other anti-American appointments made by BO. Our messages to each other have always been geared not just to provide information but to provide information that we can do something positive with. The responses below fit that bill. BTW - Some wondered why I entitled the original message "To The Socialists Of All Parties." It is the dedication that Friedrich Hayek put in his classic book "The Road To Serfdom" originally published in 1944 - the same year as the Norman Thomas Socialist Party Of America speech that was the inspiration of the original message. The statement quoted from Norman Thomas is so scary....but I believe it is true! Tell Carol we are too nice and have been silent too long. Fight fire with fire - that's what they understand. Fight them with their own fodder & call them out. I have been talking with friends and we all are shocked how it happened. Make no mistake the Socialsit-Democrat party has been looking for Specter for a long time and finally officially got him. They love corruption - that's why they smile and talk to cover up their real intentions and agenda until now and all we can do is wait for the next election. Well said. Simply put, it is time for us to make our stand. We need to stop complaining about the media being against us, etc. The liberals learned back in the 60's that every day is an election day, that every day they need to get their message out. The so called "leaders" on our side seem to think they can mention something once and then do not have to repeat it. We abandoned the cities, (remember up until the 1960 election most blacks voted Republican), and act afraid to attract minorities. Whether many folks like it or not, American is becoming less white and it is our job to go out and attract these groups to ideas such as freedom, liberty, etc. Instead the "leaders" on our side seem to think that preaching to the choir is going to carry the day. IT ISN"T, we need to grow our side. The good news is that sooner or later, the left will fall under it's own weight, (read "Atlas Shrugged"). It is our job to make it sooner. Which brings me on how to do it. Our side needs to get better at public relations. The Republicans stink at it. And it will not improve until the dead weight is gone. For years I would hear Limbaugh's, Gingrich's, etc make comments that the nation is turning more conservative. These statements were and are utter nonsense. On what grounds or evidence do they base this assumption on? One small example. Think about TV shows that was were considered risque as short as 10-15 years ago. Now they look downright quaint. On the government side we have been forced to listen to so called fiscal conservatives on "our side" argue, "the size of the deficit does not matter". This is what is passing as conservative? Two quick ideas, if the left wants class warfare, GIVE IT TO THEM! Call out every rich liberal who cries unfairness and demand that they give up all their money "to the poor". Every actor or actress in Hollywood who keeps making the faux, "I am a socialist at heart" statement, call them on it! Demand that they take their million dollar salaries and divide it up equally among all the struggling actors in America. Health care reform? Easy! Demand lawyers also be socialized and watch how quick health care reform via socialism is dropped. All great movements (religious, political, social) came from the bottom, the grassroots level. 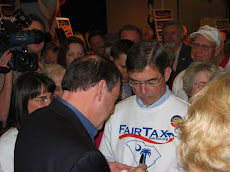 Be it The FairTax, Immigration Reform, Health Care Reform, Social Security Reform, etc the movement for change has to come from us, the people. 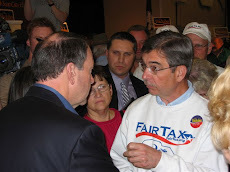 The time has come for us to start running candidates (again there should be a FairTax candidate running in every district in this state, if not the entire nation), to start giving it back. Start educating the people on the Ponzi scheme known as Social Security, how the politicians and insurance companies have screwed up health care, how judges have overstepped the authority given them in the state and federal Constitutions. We must be willing to be more confrontational and challenge the status quo. For example, I am sick and tired of hearing; "you have to respect them even if you disagree, after all they are the President, the Senator, Congressman, etc. And while they hold that office you must respect them". I respect people who earn that respect , not because they have a title. I do not care if they are a factory worker, a college professor or the President. Those who earn my respect will get it, regardless of their title. This is akin to German Jews telling their children, "we may disagree with Chancellor Hitler, but he is our leader so we must respect him." Al Gore when running for President, said to his fellow Democrats, "the Republicans are our enemy" while urging them to stick together. Well Al was right, and the liberals and the left are our enemy and our job is to defeat them and bring back free enterprise, economic opportunity, freedom and smaller government. With Lonegan we have a chance to fire a shot across the bow, let's make the most of it! Josh Muravchik, who used to be with AEI and was a regular guest on my radio show, wrote a superb book on Socialism that reads like a novel. It's a series of portaits of Socialist leaders, compellingly told, so you learn about Socialism through their personalities and the drama of their lives. It's chilling. If I were rich, I'd put this book -- Heaven on Earth -- in the hands of every college student. Here's my own diatribe against Socialism -- in the guise of an essay on Bernard Shaw, which I just discovered is listed as a source in the Shaw Wikipedia article.